Join us during this powerful episode about narrowing focus and creating your success by focusing on one thing at a time. 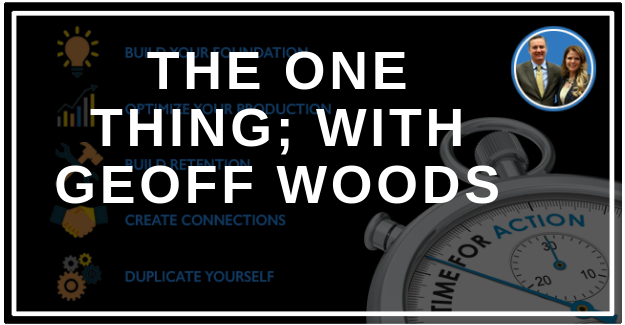 Geoff Woods is a powerful coach speaker who lets us into the secret of the incredible book: The One thing. Along with Dr. John and Wendy, Geoff will help you to increase your production and come closer to your goals— one step at a time! You do not want to miss this episode! Hey. Welcome, everybody, to this episode of the Double Your Production Podcast. I’m Dr. John Meis, and I’m here with Wendy Briggs. Hey, Wendy. And we’ve got a fabulous guest. Geoff Woods. Geoff is the vice president of The ONE Thing and hosts The ONE Thing Podcast, which is in the top 5% of all podcasts in the world. He’s a super guy. He’s gone from being a medical device salesman to running this company in a very, very short amount of time. And part of the way he did that was, he really understood the principle that I’ve learned from Jim Rohn, that you are the average of the five people you spend the most time with. So he’s now surrounding himself with high-level CEOs, successful entrepreneurs. And I just loved the message from the book. And I’m so excited to learn more from you, Geoff. Welcome to the podcast. Thank you so much, Dr. John, Wendy. It’s a pleasure to be here. So the book is a great book. And it’s funny because the first book that I wrote was also called The One Thing. Wendy told me this. I couldn’t believe that. Yeah. It’s out of print now. But it was interviews with top 5% people. There was more than 5. But anyway, it was interviews from those people. And one of the principles from my book is so much better expanded on in The ONE thing, and that’s having the clarity of vision and remaining focused on that vision. So tell me a little bit about how that comes out of the book and how that comes out in your company. Sure. Sure. So to talk people through a little bit of the background, I was in medical device sales before starting this company. And I think a lot of people who are listening to this, at some point in your life, you woke up realizing, “Wow. Things are good. And something’s missing.” That’s exactly where I was. I knew that one day, I wanted to wake up owning a massive business that made a massive impact in the world, deliver real security for my family. Challenge was, I had very comfy golden handcuffs on in medical sales. And two things happened that forced me to look at my life a little differently. First, a colleague of mine had a stroke. And at the time, he was 35 years old. I remember looking at my wife. We had just bought a house in Orange County. We had just had our first child. And she’s a stay-at-home mom. And I remember thinking, “Wow. If that was me, what would happen to my family?” And the next week, my company needed to make a change to our commission structure to remain competitive in the marketplace. And overnight, 40% of my income evaporated. Yeah. And I thought myself, “Things will get better,” which nobody else has ever told themselves that before, right? Hope was my plan. I now know that hope is not actually a plan. And It took my bank account almost hitting zero and me questioning how am I actually going to pay the mortgage before I woke up and realized I actually need to make a change. And that’s when I heard that Jim Rohn quote, “You’re the average of the five people u spend the most time with.” I just set out very intentionally– that was my one thing. How do I surround myself with successful entrepreneurs, people who are where I want to be, so that hopefully, they can mentor me and guide me along the way? And as a result of going down that path, I met Jay Papasan, the co-author of The ONE Thing with Gary Keller. Jay was the keynote speaker at our national sales meeting. When he came off stage, I cornered him. I had a conversation with him. And we started to build a relationship where I actually never asked a single thing of him. I just kept asking, “How can I bring value. Where were they focusing? Where did they need help? How could I bring value to them? And there were four separate occasions that I brought value to him without asking for anything in return. And on the fourth time I asked them where they were focusing, he said, “Gary and I are looking for a CEO for a publishing company.” I remember looking down at my scrubs and thinking, “Well, that’s not me.” But I knew three people that were, and I offered to make a connection. And when we got on the phone and he described the person they were looking for, he surprised me because he didn’t describe those three people. He described me. So that launched this opportunity for me to move my family from Southern California to Austin, Texas to turn the book The ONE Thing into a training and coaching company. And here’s what I realized very quickly. Most people have had those days where they’re really busy. They work really hard. They’re busy all day long. And they fast forward to the end of the day, they look up and they go, “I was busy. Did I get anything done [laughter]?” Right? And I realized that this is where the one thing lies. There is one thing that you can do, such that by doing it, everything else would be easier or unnecessary. The question is, what is your one thing? And are you doing it first? That’s such a powerful question for many in the dental industry because we hear this all the time, don’t we, Dr. John? We’re doing great, our practice is super busy, we’re running around all the time with our hair on fire, and we start talking about being more intentional and maximizing productivity and maximizing opportunity. One of the first things they say is, “We just don’t really have the time,” right? “We don’t know where we’re going to fit one more thing in.” But in reality, they may be busy, but they’re really not accomplishing their one thing or their goals. So they’re really not even making progress towards continuous improvement because in their minds, they just don’t have time for anything more. That’s correct. And if that’s you who’s listening to this, you’re not alone. This is the majority. And frankly, it’s not your fault either. I don’t know about you, Wendy, or Dr. John, when in school, were you taught how to develop the habit of priority, as a habit, having clarity on what matters most, and the habit of acting in order of priority? Yeah. I know I never got any of that in school. Never. I didn’t see that class. I didn’t go there. And really, when you look it training programs or opportunities for seminars and such, there’s really not very many people talking about that either. It’s a lot of tactical, what to do every day in the trenches, but there’s not a whole lot of strategy that can help business centres think that way. Well, now you just described why we’re in business. So many dentists are– Wendy and I joke about it, that they’re kind of bright shiny object people [laughter]. [inaudible] this category that we keep adding. We keep seeing something that’s interesting and we add, we add, we add, we add. But in reality, you’re probably going to make more progress if you subtract stuff by focusing on a handful of the most critical things. So good. I learned this lesson the hard way. In my first 90 days of being in business with Gary and Jay, I had to demonstrate that I could do three very specific things, otherwise I was fired. Our definition of a job description is not everything that you need to do, it’s what are the two to three things you have to do exceptionally well, otherwise you get fired. Which for the people who are listening to this, if you think about your staff, pick any one of them, if I was sitting there coaching you and asked the question, what are the two to three things that person has to do exceptionally well, otherwise they get fired, would you draw a blank? Or would you be able to go, “Easy. They have to be able to cast a vision. They have to be able to lead with revenue. They have to be able to recruit and retain amazing talents those are my three. So right there alone – by the way – there’s an opportunity for most of you. So my job description– the thing that I had to do– I had to prove that I could cast a vision for our business because if I had to rely on Gary or Jay to think about the vision, why did they need me? I had to prove that I could drive revenue. I had to generate $100,000 in 90 days or less out of thin air. And then I had to prove that I could recruit and retain 1 person that was amazing talent. I had to do all three of those in 90 days, or I was fired. And we act in order of priority, so number one was vision. And I remember I walked into the board room with Gary and Jay and handed them each a copy of my GPS. That’s what we call our one-page business plan because it’s really tough to be on the same page if your plan literally is not on the same page. I handed them each a copy of this plan. And on it, there was a goal at the top, one big goal, and then there were three things on it, the three priorities in order of priority that if I accomplish them, would make accomplishing the big goal easy or unnecessary. We started talking about number one. Gary and Jay asked a bunch of questions. I remember answering them. I said, “Are we good?” They go, “Yeah.” And so I started talking about number two. And pretty quickly, Gary started going back and asking questions about number one again. And I remember, Dr. John, I remember sitting there going, “I thought we already covered that, but okay.” I answered the questions. I said, “Are we good?” And he goes, “Yeah.” And so I wrapped up number two. And, Wendy, I started talking about number three, and Gary went back to number one. And at this point– have either of you seen Meet the Parents? You know the circle of trust? Yeah, I wasn’t in it [laughter]. I’m looking at Jay, he’s just giggling in the corner going, “Why does Gary keep going back to number one?” I didn’t get it. But I answered the questions. I said, “Are we good?” He said, “Yeah.” And so I go back to number three. And after about 10 seconds, he stops me a final time and he asks, “Jeff, do you need to do number three in order to do number two?” And I said, “No.” And he said, “Do you need to do number two in order to do number one?” And I said, “No.” He said, “Then do me a favor. Draw a line between number one and number two. Or even better, rip the page in half. Don’t even think about number two and number three until you’ve earned the right to by mastering number one.” It was at that point I realized I had fallen trapped in the number one lie of productivity. The lie that everything matters equally. I did what I think a lot of people do as a business owner. They look at all the things that need to be done. They tell themselves it has to all be done. And because they’re that person who has the drive and the self start. They feel like they’re the one that has to go and do it all versus understanding that, “These are all the things I need to do. And if I allign my dominoes up correctly, if I just knock down this one lead domino, everything else becomes easier or unnecessary and I don’t earn the right to focus on anything else until number one falls down. Yeah, that level of focus would be so helpful for our listeners. Very, very rare, as it stands, in dentistry. Our profession is a very unique profession where, as you said, a lot of people do fill their days with being busy. Even down to the minutia of the schedule. They might have a full schedule, but it’s not necessarily productive. So it’s such a rare thing to see that level of focus. I think they confuse activity with progress a lot of times. Because often they don’t– many dentists don’t have a clear vision and they don’t track their progress along that vision. And so if you’re not tracking your progress, you really don’t know if you’re on track to hit your goals or not. And so I think that’s why they start getting off into all these different distractions instead of focussing on just that one thing. Well, I heard my partner Jay say this, and it was so profoundly simple and it surprised me. He said, “People know how to set goals. But they don’t know how to have a relationship with them.” And when you think about a relationship with your significant other or somebody who’s really close to you, you have all these interactions and you know when things are going well and you know the moment that something goes off. You always know how you’re doing. Are you growing together? Are you growing apart? You’re always clear because there’s a consistent reinforcement and feedback [with a?] how am I doing. We just don’t have that with our goals. We’ve a vision of what we might want out of life or what we want to accomplish by the end of the year. But people aren’t– they don’t understand how to go all the way back to what are the specific measurable things that I must do this week. I’m talking a handful, three to five things max, that I must do this week to absolutely be aligned and on track with my goals. And if I don’t do it, what’s the consequence and how will I make up the gap? Another stumbling block that I’ve seen a lot of dentists run into is that because they know a lot about dentistry, they think they know a lot about everything. And they often think they are the ones that have to do everything or at least start everything. Yeah. So my partner Gary Keller, he started Keller Williams. It’s now the largest real estate company in the world. And I heard Gary say what makes a good entrepreneur is they see all the things that need to be done, and they’re able to do just enough of each one of them to get the business up and running. The trap is they believe that they’re good, or even great, at all of it and they hold on to it. Instead of recognizing that they could find one person who is extraordinary at accounting, one person who’s extraordinary at administrative and operations, one person who’s extraordinary with customer experience, whatever those areas of your business may be, and leveraging through them. And it’s why most entrepreneurs ultimately kill what they start. No one succeeds alone, just most people try to. The who is often more important than the how. Oh. You know the difference between a millionaire and a billionaire? A millionaire sees an opportunity, and they ask, “How can I do it?” A billionaire sees an opportunity and they don’t lift a pinky until they find the perfect person and make it their opportunity to do it inside their world. You were just talking about that, Dr. John, it’s not often how or what, it’s who, right? It’s who we know and who within our organization can take that on for us. And if dentists [could?] just not think about the what and the how as much as they thought about who, who on their team would thrive giving that half or how could they develop the people to be able to take on those tasks, [taking?] so much further ahead. For you who’s listening, this is something I learned from Gary that was just so impactful when it comes to this mindset. Think about a time you’ve ever had a job that you quit. You quit because one day you woke up and you realized you couldn’t have everything you wanted by being inside the world of that organization. That’s why people leave. So Gary has taught us to ask a different question. How do we give ourselves permission? It can make our worlds so big that the most talented individuals could step inside your world, have everything they could possibly ever need and never need to leave. That’s a really big question. You probably don’t know the answer. You probably just thought, “I don’t know, Geoff.” But instead of going and checking email, that’s when you have to go search. You search for the answer. When you think about the people inside your organization, are you actually clear on what they want out of life? And are they clear how by being inside your world you are the vehicle to them getting what they want out of life? Because if they can connect those two dots, do you think they ever leave you? All right. So you’re hanging out with all these billionaires and entrepreneurs. What are some of the other most impactful things that you’ve learned? Oh, boy. Everything is surprisingly simple. It’s why on the of The ONE Thing it says, “It’s the surprisingly simple truth behind extraordinary results.” I think people, even if they have clarity in their priorities the mistake that we see people make is that if we opened up their planner or their digital calendars, they don’t actually reflect their priorities. Most people, when they look at their calendar, they see appointments with other people, they see reminders of little things that they need to do, [the?] 80% work. And their day is filled with things that just– they treat everything like it matters equally. And I developed this habit early on working with Gary and Jay that how do we actually begin to schedule our time so that it aligns with our priories and it’s a concept called time blocking. Scheduling time with yourself for your most important work. You guys are dentists, you get it. Getting into the dentist office as a patient is a pain. I actually had to reschedule my appointment yesterday. And I know that I’m at least three weeks out. I’m not happy about that. So no matter what, if I can avoid rescheduling that thing, I defend it. I defend that time block. The question is, why don’t we do that with the things that actually matter most in our professional world, in our personal world. And you know I think not even defending it, but just having the discipline to even get it scheduled. Or even the discipline to define what that actually is. I think we’re getting ahead of the curve just a little bit because I think a lot of dentists and teams– Dr. [John? ], how many times did we ask them what’s your vision and they really can’t even provide that with a measure of clarity? Now granted, our listeners are probably a step ahead because I think they’re the ones that are actually actively working on their business. But I think in some ways, that whole concept, although brilliant, might be overwhelming to some of the people listening. I love what you said there, Wendy. For some people that might be a little step ahead. If we asked you out of everything that we’ve talked about so far, what’s the one thing you can do? Essentially by doing it, everything else would be easier or unnecessary. And for you, that little two-inch domino that you can knock over right now might just be once a day asking the question, what is my one thing? Whether or not you find an answer is irrelevant at this point. It’s about, can you identify the lead domino that you can knock over and can you ask that question every single day for the next, on average, 66 days? That’s how long it takes on average to form a habit. Because then you develop a habit of thinking in order of priority, which then makes acting in order of priority easier or unnecessary. Really interesting. Really interesting. I’m just sitting here thinking about my own time system, my scheduling system, and I’m really disciplined about those things. But this is something that I think would help me even go to the next level really in how I think about my time and how I block it. And how I just need to turn my phone off so Wendy can’t call me all the [laughter]. Yeah. Thanks a lot, Jeff [laughter]. Hey, Dr. John, do you mind if I turn the tables on you? Not a bit. Have at it. Okay. So I’m just going to flip it and ask you questions that my coach would naturally ask me. When you think about how you’re currently managing your time, what’s the one thing you’re not doing? That if you started doing immediately would completely transform how you invest your time. I think it would be to narrow the focus on the things that I’m working on to fewer. Going deeper on fewer things, rather than trying to cover as many things as I’m doing now. Okay. And I’m going to now narrate for people who are listening because I’m actually walking you through what it looks like to identify your one thing. He said that he could see an opportunity to take his time management to the next level. So I asked him a simple question. What’s he not doing that if he started doing would change everything? And he gave an answer. Most people find the first answer and they stop searching. This is when we have to go deeper. We think big about our future but then we go really small, to the point that it’s a two-inch domino you can’t knock over. So Dr, John, I heard you say that the one thing that would make everything easy or unnecessary is actually focusing on doing less. Correct? What’s the one thing you can do such that by doing it would make focusing on less easier or unnecessary for you? I guess would be to take all the priorities– take all the projects that I’m working on, prioritize them, and just work on the highest priority first. And what’s the one thing you could do that would make prioritizing and acting in order of priority easier or unnecessary? Yeah. Good question. First, just the act of doing it. But, second, looking at the framework in which I would prioritize. Well, you can prioritize based on what has the most financial impact. Or what allows you to do your unique ability more. Or what’s going to provide the most support to the rest of the team so that they can multiply their results. So what I’m hearing you say is that if you had a framework that gave you a method for prioritizing, so that when you looked at what you needed to accomplish this week you were looking at a handful of things, that that would make everything else easier or unnecessary? Cool. Would you like me to give you that? It’s called a 411. This is a tool that when we go and do corporate trainings, whether it’s Fortune 10 down to small business, the tool is always the same. The 411 stands for the relevant truth or information. It’s what’s the 411 on that? It also stands for four weeks, one month, one year. What I’ve learned from Gary is the mistake most people make when they set goals is that they set their goals looking forward. The challenge with that is that they don’t know what a priority is from a distraction. Here’s what I mean by that. I just hopped on a plane from Austin and flew to Chicago. Now if my plane was 10 degrees off course and it didn’t correct, I would end up in a completely different state. When we set goals just looking forward, we see all the things we could do. But if you really extrapolate that out over time it leads to a massively different life. The way that billionaires set goals is they time travel. They go out into the future and ask, “Where do I want to be someday from now?” They they’d pick a point in time and then they imagine that they’d turn around and look backwards over their life and say, “Great, where do I need to be five years from now to be on track for my someday? Okay, got that. Where do I need to be by the end of this year to be on track for my five? Okay, I got that. Well, what do I have to do this month to be on track for my year? Okay, I got that. What do I need to do this week to on track for my month?” It’s a process called goal setting to the now. The 411 is a template where what I would suggest to you and I can send this to you, you first and foremost ask the question, “What are the handful?” I’m talking three to five things max. Major priorities that you must accomplish this year for your role in order of priority. Meaning, you only get to do number one, that’s the most important. You only get to do number two until you’ve earned the right to by mastering number one. Once you get clarity on the year, you then ask the question, “Great, what are the handful of priorities I must accomplish this month to be on track for the year?” Once you get that answer, you then ask the question, “What must I accomplish this week to be on track for the month?” And each of these, you’re taking three to five things max. Now, you were saying how you prioritize whether it’s financial or the impact of the team whatnot, these are the things that you own. Wendy’s 411 would have different priorities because she has different ownership of different priorities in the business from you. Correct? Yep. So this is how it flows up in an organization. The organization has a big goal. There’s all these ways that it can happen and there’s individuals who own pieces of that plan. Those pieces drive their 411. And the 411, you update every week and it’s a conversation you would have to gather as business partners. What are your priorities for this week? How is that aligning with where you want to be this month? How is that aligning with where we need to be by the end of this year? That’s how you have a relationship with your goals. Love that. So Jeff, is that a tool that you would mind us sharing with our listeners? Of course. If you guys go the the1thing.com, that’s with a number one in the URL, the1thing.com. If you click on the free stuff page, everything’s better free, you’ll see the 411 on that page. Awesome. So these are great tools to help people cap their visions and Dr. [inaudible] is a very similar process and he does a vision day with some of our members [inaudible] set their [side?] their plan and kind of work backward. And so, certainly, it’s something that’s not unfamiliar but I do think that it’s great to really focus on asking those questions and everybody can always search deeper. Right? I think you’re exactly right. The first thing that comes out is just what’s on the surface and to really make progress, we’ve got to keep asking those questions until we really dial in on what matters. Can I share a story on that? So again, people do not decide their futures. They decide their habits. And their habits decide their futures. For everybody who just listened to that section we just went through on the 411, you probably felt you just drank from a firehose. It probably didn’t sound like, “Oh, that’s so simple.” But the focusing question on the book is what’s the one thing you can do? Such by that doing it, everything else would be easier or unnecessary. It’s not what’s the one thing you think you should do, your wife tells you should do it, you can actually do it. And so, I would ask every single one of you out of everything we’ve talked about in this episode so far, what’s the one habit you can form? That if you formed it would make living these principles easier or unnecessary? I ask that question in my first month on the job because Jay told me the fastest way that I could get out of business with Gary and Jay, was to not lift the book. And the book is about developing power habits. So I had to go on a 66-day challenge to forming my first power habit. And I realized that if I could only form one habit, it was going me to have it a priority. And the one thing I could [to form? ], to have it a priority was to do a regular 411. And the one thing I could do to a weekly 411 was to, once a day, check my 411 before I checked my email. Check my priorities before I checked everyone else’s. And isn’t that the truth? Whether I filled the 411 or not, if I simply looked at it and realized that it wasn’t filled out, was I more or less likely to fill it out? More. And if I filled it out, was I more or less likely to be aware of what mattered most? More. And if I was unaware of what mattered most, was I more or less likely to do it? You fast forward and that becomes a habit. Suddenly, you will find yourself getting far more done because you’re knocking down the 20% dominoes that will generate 80% of your results. And you’re getting greater results in less time with less stress. So [tricky?] with all of the insights. And I know our listeners will have as well. It is my pleasure. One thing I’ll share– because this is the mindset behind it. Most people are probably listening to this and they just go, “Oh, it’s so simple.” Have clarity, what matters most, do it first. Here’s the challenge. Most people up until this point, you’ve been failing so slowly, you thought you were succeeding. You’ve been failing so slowly, you thought you were succeeding. You ran through your practice. You saw all the things that needed to get done. Fires came up. You put them out. You moved on to the next thing. All of a sudden, your email notifications went off. You handled the emails. A team member came and then said, “Hey. You got them, and you helped them real quick.” And you felt like you were succeeding. But the truth is you actually failed so slowly. You weren’t clear on what mattered most. You weren’t acting in [ordered?] priority. But the results weren’t there immediately, which is why it felt like success. You then start implementing these principles and it flips. Suddenly, you start succeeding so slowly, it feels like you’re failing. You’re going to get clarity in your one thing, and you’re going to go and you’re going to look for the trophy. All the millennials out there, they’re going to be like, “I got my one thing. Where’s my trophy [laughter]?” And you’re not going to see it, and it’s going to feel like a failure. The number one reason people fail to live the one thing over time is they are unwilling to endure the monotony of success. Success is not the latest productivity hack. It’s not the latest equipment for your office. It’s not the latest whatever book or diet. It’s about having clarity on the handful of things that if just done day after day after day after day after day, over time, will lead to extraordinary results. Our question for you is, what is your one thing? And how will you endure that monotony of success? Yeah. Fantastic principles. Well, Geoff, you gave your website already. Is there a place that someone should start when they go to your website to learn more about your company and how you could help people? Sure. So we are a training and coaching company. So if you go to the1thing.com and you click on the training tab, you will see all the trainings we do, whether that’s individual trainings through online, whether it’s in-person events that we host, whether it’s corporate trainings, and you will also see our coaching there as well. Fantastic. Well, I so appreciate you being on our podcast today. You gave us some really thought-provoking stuff. I’ve got about two pages of notes here [laughter] and great notes with things. And so I appreciate you putting me in the hot seat and asking some really [inaudible] questions. So thank you.